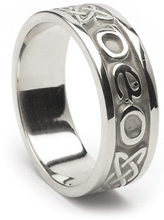 This ring says “Love forever“ in gaelic, as well as incorporating the celtic love knot. 10ct Yellow gold. This beautiful ring is unique, in that it says “Gra Go Deo” on it, which means “Love forever” in Gaelic, while also incorporating the celtic eternity knot, which represents forces moving in harmony forever. To see further pricing click Gold carat options above. Please check our shipping section to see shipping availability, times and locations.